Ferruginous Hawk - The ferruginous hawk is a large, broad-winged hawk that nests in the grasslands of the western United States. Burrowing Owl - The burrowing owl is a small, ground-dwelling owl with long legs, a round head with an oval facial ruff, and no ear tufts. 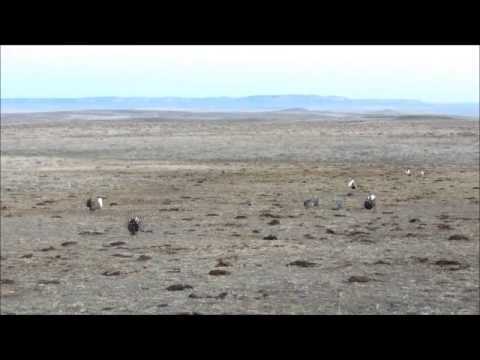 Sage-grouse - Most breeding occurs on strutting grounds (leks) during March and April. Mountain Plover - The mountain plover is a small bird approximately 8 inches in body length, similar in size and appearance to a killdeer. Black-tailed Prairie Dog - The black-tailed prairie dog is one of five species of prairie dog, all of which occur only in North America. Our conservation strategy focuses on 2 ecotypes and 8 species to maximize conservation benefit and to promote sustainable populations and habitats. Sagebrush Steppe Ecotype - Specific emphasis in areas within & adjacent to sage-grouse core habitat management areas. Shortgrass Prairie Ecotype - Specific emphasis on areas providing heterogeneity on a landscape level. The Association submitted the final draft of the conservation Strategy (integrated CCAA/CCA/CA) to the US Fish & Wildlife Service (FWS) on July 23, 2013. An Interagency Memorandum of Understanding (MOU) was finalized May 16, 2014 by the Association, FWS, BLM, Forest Service, and Wyoming Game & Fish Department. This MOU defines the responsibilities of each party and establishes a Conservation Advisory Committee to advise the Association Board. Final review of the Strategy was completed by FWS and the solicitors in early November 2016. The Association hired a third party contractor to complete the necessary Environmental Assessment (EA) for the Strategy under the direction of FWS. FWS, along with BLM and Forest Service as cooperating agencies, finished an initial review of the draft EA in early November. Following signing of the Interagency MOU, the Association invited qualified professionals to serve on the Conservation Advisory Committee. The Committee has met several times and has recommended conservation priority areas and process changes to the Association. Members are working with the Association to assess threats and develop appropriate conservation measures. Both the conservation Strategy and the associated EA will be in the Federal Register and available for public comment on November 28, 2016. We anticipate signing of the Strategy with FWS and the cooperating agencies in the first quarter of 2017. Once the Strategy documents are signed, the Conservation Advisory Committee and the Association will begin reviewing site specific conservation actions for participating members. Conservation commitments will be documented and approved with on-the-ground implementation beginning in mid 2017. Develop a responsible, common sense, science-based approach to landscape management within the five northeast Wyoming counties. The Thunder Basin Grasslands Prairie Ecosystem Association coverage area spans 13.2 million acres in northeastern Wyoming and southeastern Montana. This includes Campbell, Converse, Crook, Niobrara, and Weston counties in Wyoming along with portions of seven additional counties in Wyoming and three in Montana. Current members of the Association own over 1.2 million acres of land within this mixed ownership landscape. Other lands include Thunder Basin National Grasslands administered by the USDA Forest Service through three local grazing associations, Bureau of Land Management lands, state lands, and additional private lands not currently in the membership of the Association. The Thunder Basin Grasslands Prairie Ecosystem Association is a non-profit organization established to provide private landowner leadership in developing a responsible, common sense, science-based approach to long-term management of their lands.